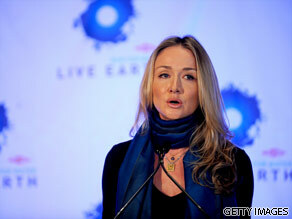 Explorer Alexandra Cousteau is part of one of the worlds most famous environmental dynasties. She is grand-daughter of legend Jacques-Yves Cousteau who first started teaching her to dive at the age of seven. Alexandra Cousteau is your Connector of the Day. Today she is still just as much involved in water maintenance around the world. In 2008 she founded Blue Legacy a Dc-Based non profit that tries to promote emerging technologies to connect mainstream audiences with their local watersheds and their water planet. She has also been the host of the Discovery Channel show, “Blue August” with her brother and served as a Chief Correspondent on Water Issues for Discovery’s “Planet Green”. And in 2011 she will release her first book entitled "Blue Planet"
Her brother, Philippe Cousteau – a former connector of the day – is also a prominent environmentalist and the two have been very involved in helping with the Gulf Oil spill clean-up. Currently Alexandra is on an expedition with Blue legacy that is travelling 14,500 miles across North America to look at the water issues that are most pertinent today. What would you like to ask Alexandra? How far has the Gulf spill set us back? IS the world doing enough to preserve water? Here's your chance to ask questions and we'll put them to her. –	What is your opinion on the way Barack Hussein Obama’s administration is Improving the Protection of Human Health & Environment? – What is your opinion on the way Akihito, the current Emperor of Japan, is handling the BLOODY DOLPHIN KILLINGS in the JAPANESE WATERS, which have been stated in the Oscar movie “The Cove”? – What is your opinion on the way Achim Steiner, the current Executive Director of the United Nations Environment Programme (UNEP), is Improving Developing Countries in Implementing Environmentally Sound Policies & Practices? I am awaiting Alexandra Marguerite Clémentine Cousteau’s replies. Which of the main commercial fish species do you feel have passed the point of no return. Atlantic Cod were once a primary catch but their numbers may have dropped below sustainability. And what about swordfish and grouper? With 6.5 billion people – and growing – consuming resources and generating refuse at ever increasing rates, do you believe a practicle solution to the degradation of our water resources is possible? If so, what can cause this trend to change? I live in India,last 2-3 years we had observed severe drought like situation almost in the whole of the country(though this year there are good rains), and we saw a rise in crime and spate of killings because of lack of drinking water-people actually killing for water. Now my question is-Isn't water a basic right of people?Can't Governments and the UN make laws and legislations to safeguard this basic right? Rivers are drying up,chemical waste is being dumped in water bodies,river and seas.Sewage and garbage being let in streams and rivers-this is a situation faced by almost all the countries of the world. I want to know that can there be country specific tailor made solutions to tackle this problem and be kind enough in suggesting solutions which we indiividuals can observe(as i believe Govts around the world have their hands full). Given the plastic in the Pacific Gyre, the oil leaks and gushers in the Gulf of Mexico and elsewhere, the overfishing of the oceans, lakes and streams, the pollution caused by pesticides, herbicides, and fertilizers, and other forms of violence we are doing to the watery part of our planet, it is hard to feel hopeful about the future of either the Earth or humanity's prospects on it. What, if anything, gives you reason for hope, and how can we amplify or support that hope? I wish that the Cousteau society would highlight a huge problem which is epidemic here in China/Hong Kong–shark finning–for shark fin soup and other things. I live in Hong Kong near the shark fin shops/stores/supplier. I keep noticing the shark fins they are laying out to dry on the street are becoming smaller and smaller-hence the killing of even younger sharks-There are not going to be any sharks left in 5 years at this rate.Help! Cousteau was one of my "heroes" as a child but he fell flat on one account – the little rabbit. He knew and said over-population was a problem but he obviously did nothing about hit as he had 4 children I believe. When will people understand exponential growth? Anybody who has more than two children commits a crime against humanity, against the planet and against intelligence. Sorry – and just so I don't appear a total hypocrite I have 0 because I want to spare them the suffering that is to come. What is your stance on this ma chere Alexandra? Do you think that depopulation is the only way to save the planet? It seems everybody knows about the garbage plastic patches all around the oceans, which upon desintegration enter the food chain, but no government action is seen. How serious do you think the problem really is and how can we make governments that ir seriously and start acting? How serious do you think the problem really is and how can we make governments take it seriously and start acting? How can we get people, especially in arid countries to use more water efficient crops? And stop burning their trash? my question is ..'how come we worry about other countries when as a great nation such as the usa flaunts the water in excessive use....creating spas showers that just promote more and more useless water'? they are nice but now kids and adults are staying in the shower longer and longer wasting this precious resource. but if we concentrate on third world countries such as central america (where i am) how come i have seen no one to come and promote sewer systems. at the moment all the towns on the sea are dumping their waste into the sea. it is normal practice. no one thinks twice at this. also trash is dumped constantly in the sea as well.......and then the trash burning as well as slash and burn. no recycling is seen though bottles have it on them. no one seems to care....aren't governments concerned???? When might we expect to see Alexandra´s answers to the posted questions? Do you beleive that fish line lost can be greatly reduced. The fish line I'm refering to is the one that unseen and is at the bottom of many river systems. It is one of those things that OUT OF SIGHT AND OUT OF MIND. As a fishermen I know it's there and it also is there for a very long time for dosn't decay under the surface.